The payroll tax exception for 1099-MISC income wasn’t something I addressed in the Roth IRA post (although I mentioned it as a perk for some students) but I probably should have. You do not pay into the Social Security and Medicare funds when you receive a 1099-MISC for your income, which means that you get to keep an additional 7.65% of your gross income compared to someone being paid with a W-2. In the Roth IRA post I only explained that some fellowship income isn’t considered “earned” and why I thought that was a ridiculous categorization. I didn’t attempt to answer “Which type of pay is better for the recipient?” but I will in this post. I’ll run through the numbers of a few reasonable scenarios to see which comes out ahead and then make a recommendation. In all scenarios, I will consider a first-year graduate student making $24,000 per year, investing in a fund (inside or outside of a Roth IRA) that provides a consistent 8% rate of return. I will not consider inflation. (As I’ve noted, these parameters do not reflect reality but they are useful for distinguishing among hypotheses.) While in graduate school the students are subject to a 15% federal marginal tax rate and post-graduate school they are subject to a 25% federal marginal tax rate, with a 6% state tax rate throughout. I’m using this calculator and assuming monthly compounding. I assuming graduate school lasts 5 years (ages 25 to 30). At age 25, Angela is paid with a W-2 and Bertrand and Coretta are paid with 1099-MISCs. They all commit to saving 10% of their gross pay for retirement. Bertrand and Coretta, recognizing that they have an additional 7.65% available based on how they are paid, bring their total retirement savings up to 17.65%. So in one year in grad school, Angela saves $2,400 into a Roth IRA while Bertrand and Coretta save $4,236 in brokerage accounts. Angela and Bertrand don’t contribute any more money to those accounts after their first year in grad school and don’t move the money at all. 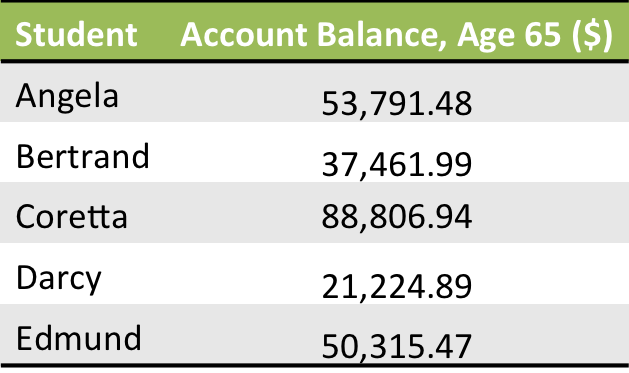 What are their account balances at age 65? As expected, Angela’s money grew faster than Bertrand’s because her rate of return wasn’t hampered by taxes. Even though he started with more savings, her account balanced quickly passed his. Coretta knew that tax-advantaged accounts would help her balance grow fastest and she was disappointed not to have access to them when he first started saving. Based on just the savings from her first year in graduate school, at the end of her PhD (age 30) she has $5,450.77 in a non-tax-advantaged account. She is offered a job paying $80,000 per year, of which she saves 15% into her 401(k). Assuming she starts working in July, she plans to contribute $6,000 to his Roth 401(k) in the first calendar year she has his job, leaving $11,000 of contribution room (2012 levels). She decides to take the full balance of her brokerage account and put it into his Roth 401(k) in the first year. Based on just how that portion of the money grows, the money saving during her first year of graduate school will be $ 88,806.94 at age 65. In this case, the additional contributions at the outset well outweighed the few years that the money spent outside of tax-advantaged accounts. Another consideration is that because Angela paid in to the Social Security and Medicare systems during graduate school, she may receive more benefits in retirement. I will consider this benefit negligible as the program, if it even exists, will have gone through major reforms by that time. So it seems that Coretta comes out ahead by far! But how likely do you think it is that students behave like Bertrand and Coretta and save all of the pay they might otherwise have paid in payroll taxes? Darcy and Edmund didn’t – they both saved only 10% into non-tax-advantaged accounts. Darcy followed Bertrand’s path of leaving the money be and Edmund followed Coretta’s path of getting the money into a tax-advantaged account as soon as possible. 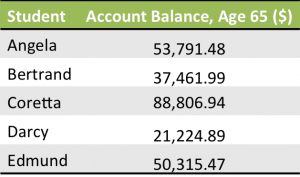 In this case we can see that having the money in a tax-advantaged account for even a few additional years boosts the account balance slightly. We should consider some qualitative factors in these situations as well. I find it unlikely that students will put all of the 7.65% income boost into retirement accounts, mostly because they would not view it as an income boost but just their normal pay. In my observation and discussions with administrators at my university, earlier-stage students are more likely to be paid by fellowships/1099-MISCs than later-stage students. Therefore it is more likely that an individual student will start off not having payroll taxes removed from her paycheck and may not even realize that she will owe those taxes when she transitions to a W-2. If students do not sequester that 7.65%, they are able to enjoy a slightly higher standard of living than their peers with the same salaries being paid with W-2s. So for those who don’t believe it is important to save for retirement while in graduate school, the 1099-MISC is clearly better. If we assume, though, that some subset of students would like to save for retirement, I suspect that those “earning” income would be more likely to follow through on those inclinations because they have access to tax-advantaged retirement accounts. Students without earned income who wish to save for retirement may be discouraged from saving or confused by their options, resulting in a lower savings rate. So perhaps it is advantageous for less-committed savers to receive a W-2 because saving “for retirement” is more straightforward. Strictly by the numbers, though, the best person to emulate is Coretta – by far. Her balance is over four times that of Darcy, who also receives a 1099-MISC. Save early, save often, and save into tax-advantaged accounts. My advice for those receiving 1099-MISC who want to save for retirement is to save that extra 7.65% that you would otherwise be taxed and transfer that money into tax-advantaged accounts as soon as you have access to them. If you have substantial savings from graduate school in non-tax-advantaged accounts, it may take a few years to fit all of that money into the contribution room you have left in your 401(k) after your normal yearly retirement savings, but keep in mind that you can open an IRA as well for an additional $5,000 in contribution room and use the accounts available to your spouse, if applicable. This approach has the added advantage of creating a budget that is already prepared for an increase in taxes (upon transitioning from a 1099-MISC to a W-2), a subject I will discuss further in a future post. Would you take an income boost if it meant you couldn’t have access to a tax-advantaged retirement account? Does your situation most closely resemble that of Angela, Bertrand, Casey, Darcy, or Edmund, or a non-saver? Would you ever consider saving money that would normally be taken out in taxes? 14 Responses to "Can a Net Income Boost Compensate for Not Having Earned Income?" Great detail! What I think would be really helpful for graduate students is a retirement calculator that can take the giant boost in income that we all assume will happen once we graduate into account. While I understand that whatever saving I’m doing now is helpful, it’s almost impossible to REALLY plan for retirement until we’re in stable jobs! Agreed that planning for retirement is futile while in grad school (though DOING something isn’t futile). I actually don’t think retirement/compound interest calculators are useful for young people generally, not just those in graduate school. You really don’t know what shape your life will take – marriage, kids, where you live, home value, breaks from work, health – in a way that’s useful for planning for retirement until your 40s at the earliest, I would think. And with all those “you’ll change CAREERS seven times in your life” predictions floating around about our generation how can you even say you’ll have an income with steady increases? I guess our plan for now is to just save a decent percentage of whatever our income is at the moment and try to pin down a target range once the future comes into better focus. Joe and I discussed this issue on the previous post. In my experience and observation, if the money has the same source (i.e. the university/department) they give the student the same gross pay whether or not they or the student owe payroll taxes. If the fellowship money is from an outside source, the compensation may very well be different, but that doesn’t have to do with the payroll tax. For my last job switch, which was between two similar employers, I traded a 401K type plan with matching for a small raise, free health insurance, and payroll tax exemption. Pretty much immediately after I switched jobs, the payroll tax cut happened, and I experienced the opposite of Schadenfreude. Did you have a choice in your package beyond accepting the job or not? Did the newer job turn out to be a better deal? No choices for me. I was mostly trying to answer the question on whether or not employers seem to compensate for these sticky tax situations they get us into. I think the answer is in my case, yes? maybe? I think it turned out to be close to a wash financially, except that I ended up moving to a cheaper cost of housing area. It does put more of the burden on me to be a proactive saver. Interesting case study, even though it doesn’t directly apply to me. Still, it illustrates the importance of having a tax-advantage account…numbers don’t lie. I’d take the income boost over the tax advantaged retirement account. At some point, you’ll likely start “earning” income. Also, unless you’re independently wealthy, it’s unlikely you’re living solely off of unearned income. Just take the portion of the income you earned and invest it in a Roth IRA or a traditional IRA. Plus, while you’re in college, you’re probably not in a position to tie up large chunks of cash in retirement accounts anyway. Shawanda @ You Have More Than You Think recently posted..Student Loan Debt Is Over $1 Trillion. So What? Graduate students receiving fellowships very likely DO live solely off unearned income as we are not permitted to have outside jobs. And many (though definitely not all) want to be responsible and take the general advice of saving for retirement if you have a full-time job, which graduate school basically is if you are being paid a stipend. Hi again, glad to see I stimulated such an interesting discussion! 3. Tax efficiency of savings, even if only a little bit more or less efficient, can drastically affect returns. There is another factor I did not think about before that is probably important. Of all possible “activities” someone our age could be doing, PhD students have – by far – the greatest income growth potential. Of course, this depends a lot on your field (engineering vs humanities, etc) and your career goals (academia or other) but you could reasonably argue that the average PhD student will grow their income from 200% to as much as 500%-600% post-graduation. If you crunch the numbers, I think this would show that the vast majority of income and retirement contributions – and therefore the vast majority of ultimate savings at retirement – will come _after_ graduation. This probably implies that the best thing you can do for retirement, right now, is make sure that your career path stays on track – even if you might have to sacrifice retirement savings to do so. For example, this might mean having enough savings to continue working on your research in summers even if funding is not available (as opposed to having to take on an unrelated job to pay the bills) to avoiding distractions (living in a safer or quieter area, or buying a more reliable car) or paying your own way to attend extra conferences in your field. Or having enough of an emergency fund (if your car breaks down and needs replacement, spouse becomes unable to work, other unexpected large expenses) that liquidity is essential. Liquid assets, like cash in savings accounts and CDs (as opposed to the high growth sort of things you might have in a Roth), might be what you need to make sure your PhD doesn’t get derailed. I think this would make a really interesting personal finance blog post – what expenses and assets are “worth it” as a graduate student? Expenses that – while not strictly necessary to live, or are considered not frugal – make sense because they are actually investing in your future self? I am going through the ordeal of trying to convince my university to switch me back to reporting my stipend on my W-2. I am not sure if the payroll taxes should be an issue. I believe that graduate students who are enrolled in classes would be eligible for the Student FICA exemption. I believe the IRS even allows research under the direction of a supervisor pursuant to completing a PhD to be defined as a class. Do you know of anyone that has successfully challenged a university’s lack of reporting a stipend on a W-2 by filing Form 4852 and subsequently contributed to an IRA? Did your university actually make a mistake in your pay or are you just unhappy with the type of pay you’re receiving? If there was a mistake I hope they will correct it but if not I doubt they’ll do anything. It’s really about the source of the money – fellowship, training grant, research grant. You shouldn’t have payroll taxes if the job you’re being paid for is related to your degree (RA, TA). If you had some other random on-campus job maybe they would apply. Please let me know if you are successful and what the problem was to begin with.